Spoil loved ones at InterContinental Grand Stanford Hong Kong with delicacies ranging from authentic Italian at Theo Mistral by Theo Randall, international food delights at Café on M, to premium Cantonese cuisine at Hoi King Heen on Valentine’s Day. Theo Mistral by Theo Randall sets the romantic ambience with tantalizing four-course dinner menu. Nothing can beat the restaurant’s signature homemade ravioli made of parmesan, mozzarella, ricotta, black truffle and sage sauce, featuring pasta filled with 3 types of cheese and Italian black truffle, cooked in a beautifully made sage and butter sauce with shaved black truffle on top. 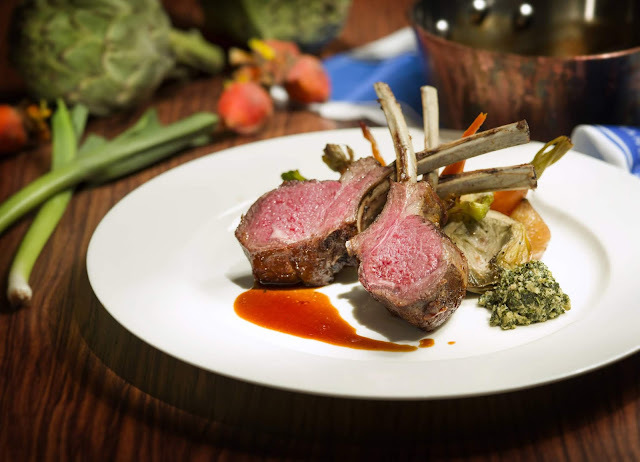 Roasted rack of lamb with pumpkin puree, grilled artichokes and thyme jus surprise palate with its tenderness and delicate flavour. To enhance the atmosphere, each couple will receive roses as a token of remembrance. For the set dinner menu details, please refer to Appendix 1. Treat your loved one to a lavish Valentine’s Day dinner buffet at Café on M where the elaborate spread of international delicacies is a sure-fire way to impress your better half. Featuring chilled Boston lobster, snow crab legs, uni hand roll and freshly-shucked French Fine de Claire oysters, plus the all-time favourites such as assorted Japanese sashimi, oven-roasted sucking pig, Valentine’s Day inspired desserts and the much-loved Häagen-Dazs ice cream, the bountiful dinner buffet simply makes your Valentine’s Day perfect. To enhance the atmosphere, each couple will receive roses as a token of remembrance. Hoi King Heen is staying true to its roots by offering an authentic Cantonese eight-course dinner for Valentine’s Day, crafting by award-winning Executive Chinese Chef Leung Fai Hung. For reservations and enquiries, please call (852) 2731 2883.